Michigan’s trout season opens on the last Saturday in April and there’s no guarantee of good weather. It’s about a fifty-fifty shot in Michigan. We’ve had balmy weather with morel mushrooms popping, thick snow that brought visibility down to fifteen feet, and every grade of weather between the two. The weather can start out nice and deteriorate quickly, or start bad and end up wonderful. In all of the years of camping on opening day I am proud to say that Feral and I only packed it up once. We didn’t want to leave. We woke to find snow, built a fire to warm up and went down to the river and fished. 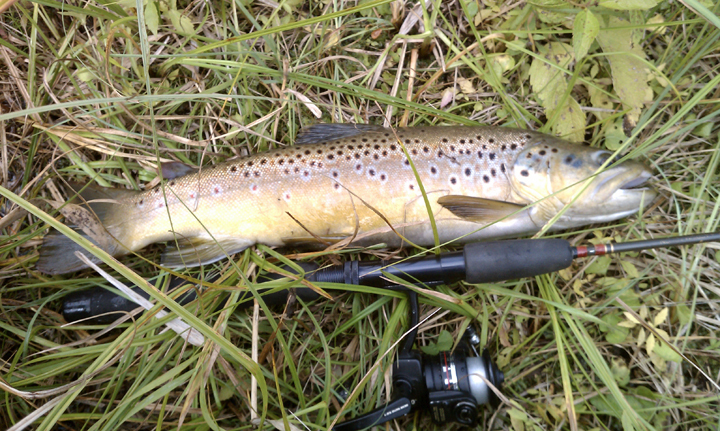 Casting was very interesting – watching the lure disappear in snow before it hit the water. As I recall the snow didn’t let up a bit. Then the real show began. Feral and I were fishing together and had moved just upstream from camp to a wide gradual bend. We were standing on the inside corner when a canoe came by. There was a young boy about age ten in front and middle-age man in the back and they were paddling like mad rounding the outside bend. At the exit of the bend some logs angled outward and sure enough they glanced off the logs and overturned. The water was maybe a degree or two above freezing and they both took a complete swim. We waded back downstream to help but the man managed to get his canoe up-righted quickly. We told them our camp was right up the hill and that we had a fire – they were welcome to dry out and warm up. The man would have none of that – he said they’d be fine and wanted to keep going. I have no idea how far they were going, maybe Feral can add a comment on this, but if they were heading to the next canoe landing they had a couple freezing hours ahead of them. We felt so bad for the boy. He may have been in shock. It just seemed surreal not to take our offered help and at least warm up at the fire. We would have been happy to drive them to their vehicle and I’m sure we offered. As far as I was concerned the dad got what was coming to him, the boy was a victim of his dad’s ego or stupidity. I don’t recall if that incident turned us off for the weekend but it may have. Feral and I packed it up and headed home with a vow to meet back there in one week. 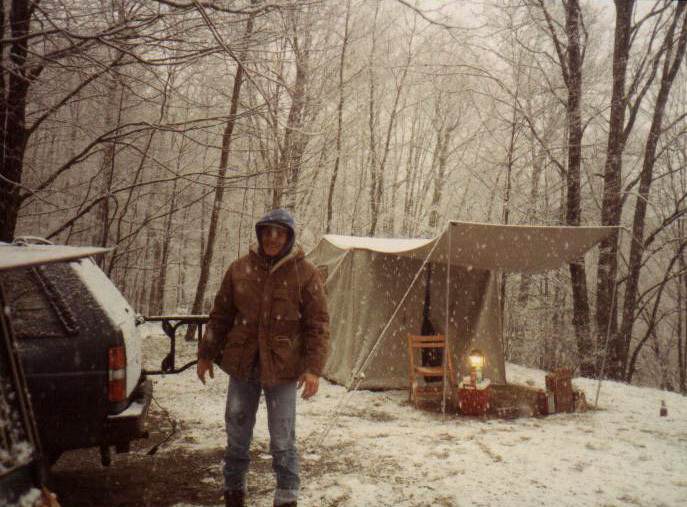 We really didn’t mind the snow and it’s not the first time we’d tented in it. It’s just that it wasn’t what we expected. We were thinking Spring. It’s January 6 and the temperature is almost fifty in Michigan. When I stepped outside I was transported to trout camp first by the warmth and then the earthy smell of spring. Reality checked my imagination but not my enthusiasm. 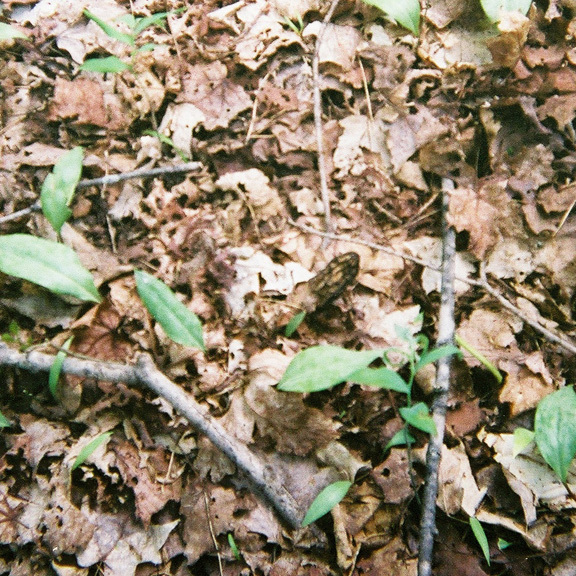 Spring brings the new trout season, and a backup pastime of Morel Mushroom hunting. Mushroom hunting finishes a close second. We find the early black morels, and as the season progresses, the half-caps. We (Feral and myself) don’t have a spot for the later white morels but maybe that’s because we’re looking in the wrong place – we keep going back to the black morels areas. It’s vexing to think back to our grandpa opening the trunk of his 65 Chevy Impala and seeing two bushels of white morels. I don’t have a clue where he found the mother lode but it’s possible those days are gone, at least on public land. A good day for us is a few dozen two inch Black Morels to fry up with some trout. And that’s enough. We fry them in butter until they are about 25% of their original size and crispy. People compare the taste of morels to steak, but to me it’s more like eating bacon. Are we frying them too long? I’ve read you need to cook them thoroughly. If you haven’t tried mushroom hunting here’s a good tip: Look for cars parked along the road in late April and early May. Most everyone expects to see other hunters so you will not be breaking any code. I have read books on morel mushroom habitat and what else I can add has very little value unless you are a naturalist with a degree in botany. Look near Elm and Ash trees, white barked trees like Birch, Poplar, and Aspen, and in evergreens like White Pine. Look where the sun is warming a hillside early in the season, and shaded hillsides late. Alongside water is good including drainage ditches along a road. If you have never been mushrooming it’s wise to go with an expert the first time. It is encouraging to see someone else find some. If they help you spot some it will be much easier to gain some confidence – they are difficult to see, especially the black ones. And the expert can cull your bag for the false morels, the poisonous variety that can wreck an otherwise nice meal.